Energy efficient vinyl windows are affordable and dependable. Your windows and doors should be as energy-efficient as possible. That’s why Simonton developed innovative, high performance glass packages designed to meet your specific needs. know the light. There’s nothing like a home filled with beautiful sunlight. Depending on your climate, sunlight can help keep your home warmer during cold winter months. 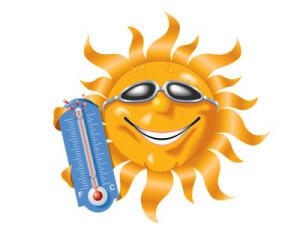 But in summer months, it can increase your cooling costs and cause uncomfortable solar heat gain. And in any climate or season, sunlight can fade carpeting, drapes and furnishings. Visible Light – Desired for the illumination that makes your home bright and inviting. UV Light – Can fade carpet and artwork. Near-Infrared Light – Causes heat gain, can raise energy costs and make your home unfcomfroable. In winter Low-E helps retain warmed air & in the summer Low-E deflects heat. Every insulating glass package has these four basic components: the glass, the gas, the spacer and the glass panes. The Glass -ProSolar glass packages feature Low E coatings for improved efficiency. Unlike clear glass, ProSolar Low E coatings help lower heating and cooling costs. The Gas – Optional Argon gas is sealed between the glass panes. This odorless, non-toxic gas is much denser than air, so it insulates better. The Spacer the spacer. Insulating glass units have at least two panes of glass, separated by a low-conductance spacer that helps minimize the migration and transfer of heat between the glass panes. Energy Efficiency, comfort and savings start here. Insulating glass units have at least two panes of glass, separated by a low-conductance spacer that helps minimize the migration and transfer of heat between the glass panes. 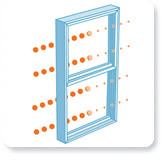 Dual-pane windows consist of two pieces of glass, with the option for Low E, Argon gas and a low-conductance.